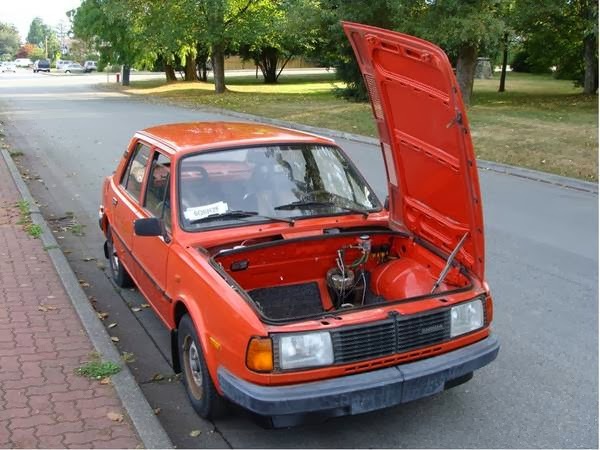 1986 Skoda 1290 GLS - The Czech-built Skoda 120 was a car of contradictions. On one hand, it was notorious for its lousy initial build quality. On the other hand, it was an extremely successful European rally car (Skodas won their class in the RAC rally for 17 years in a row) and on the street it gained a reputation for being a tough, reliable car. Based on Skoda's earlier S100/110 range of cars, the 120 was introduced in 1976. Its rear mounted, water cooled engine came in displacements of 1.1 or 1.2 liters. Besides the initial build quality problems, the first 120s were criticized for their handling. In 1984 Skoda addressed the handling problem by widening the track of the car and changing the rear suspension from a swing axle set up to a a semi-trailing arm layout. With this new rear suspension, UK's Autocar and Motor magazine compared it's handling to a Porsche 911. The build quality improved too, but was still not up to the standards of most Western European cars. This guy is selling 2 Skodas. The orange one is described as "needing some work," but "pretty much a turn-key driver." The white one is a parts car. The orange one is being offered for $1200.00, the white one for $500.00. He will sell them separately, but I would suggest you buy both. Parts, even in Canada, where these were sold, are not easy to come by. Located in White Rock, BC, Canada, click here to see the Craigslist ad. 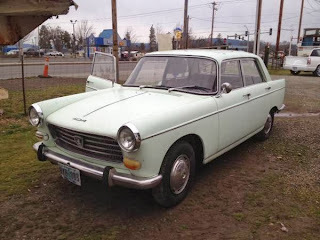 1968 Peugeot 404 - The 404 was built by Peugeot from 1960 until 1975. The body was designed by Pininfarina. Peugeot built over 1,800,000 of them. (Sedan, wagon, pickup truck, convertible and coupe combined.) Peugeot licensed to the car to several smaller manufacturers and it is estimated that another 2,800,000 were built through 1988. The 404 was known for its durability and Peugeot tried to capitalize on that in the US with the ad slogan, "the toughest bargain you can drive." In 1968 Peugeot sold 4,864 404s in the US. That was a pretty good sales number for Peugeot in the US. This 404 is said to run. It has 31,000 miles on it. The body looks very clean. If it's as good in person as it looks in the pictures, the $1500.00 asking price is very reasonable. Located in Central Point, OR, click here to see the Craigslist ad. 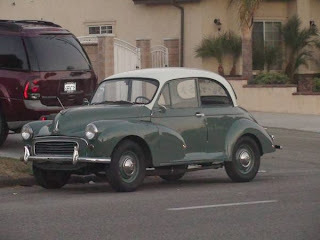 1960 Morris Minor - The Minor was never a strong seller in North America. But, in Great Britain and other parts of the world, it was huge. Introduced in 1948, Morris built the 1,000,000th Minor in 1961. The last Minor, a station wagon, was built in 1971. Located in Chino, CA, click here to see the Craigslist ad. A big thanks to Jon for sending me the Morris Minor link. That 404 seems like a pretty cool car for tge money. Im sure it'd be a basketcase to keep going but fornhow rare it is and the clean shape $1,500.... You can't get anything good for that money these days. I like it's tail end and grill. Not too mention automatique! What an awesome emblem. Haha, Chris' Skodas keeps getting mentioned on car blogs, but he still has them. Kinda sad, you can't buy weirder running cars for the money. Also, how do you become the guy with a Peugeot 404 and a Ford Contour for sale in your driveway? You don't see that every day.